The Wonderful Dharma Lotus Flower Sutra has seven rolls and is divided into twenty-eight chapters. This is Chapter Twenty-five, the “Universal Door Chapter.” It deals with the spiritual powers and miraculous functions of the inconceivable state of Guanshiyin Bodhisattva, the Bodhisattva who Contemplates the Sounds of the World. 1. Person and Dharma. The person is Guanshiyin Bodhisattva. The Dharma is the manifestation of the Universal Door. Guanshiyin Bodhisattva saves beings from the seven difficulties, counteracts the three poisons, and responds to the two kinds of seeking. Guanshiyin Bodhisattva is an inconceivable person. The manifestation of the Universal Door--the response to all seeking and the penetration of all responses--is an inconceivable Dharma. Since it is inconceivable, it is called Wonderful Dharma. Due to the causes and conditions of the Wonderful Person and the Wonderful Dharma, the “Universal Door Chapter” is spoken. What is kindness and compassion? Kindness bestows happiness; compassion relieves beings of suffering. Guanshiyin Bodhisattva saves living beings from the seven difficulties, counteracts the three kinds of poison, and responds to two kinds of seeking of living beings. The seven difficulties are enumerated in the text itself. The three poisons are greed, hatred, and stupidity. The two seeking are seeking for a son and seeking for a daughter. Living beings are all poisoned by greed, hatred, and stupidity. However, if a person who has much greed can always reverently recite the name of Guanshiyin Bodhisattva, he can separate from greed. If he has a lot of hatred and can always reverently recite the name of Guanshiyin Bodhisattva, he can separate from hatred. If he is very stupid and always reverently recites the name of Guanshiyin Bodhisattva, he can leave his stupidity. There are many forms of greed, and just as many, if not more, forms of hatred. Stupidity, however, takes neither too many nor too few forms. Stupidity means a lack of wisdom and a lack of deep understanding. It causes one to fail to perceive the principles underlying various events. In China, the philosopher Wang Yangming defined stupidity as conduct that does not accord with one's knowledge. He said, "Why does one fail to do things? Because one does not understand. If one understood, one would act accordingly." Some people say, "Well, it is possible for people to understand, but still not act accordingly." Wang Yangming would answer, "They do not really understand. If they did, they would act accordingly." His philosophy was "understanding and doing are one". If a person really understood, he would not do stupid things. Why do people do stupid things? Because they do not really understand. Why aren't the flowers always in bloom? Why isn't the moon always full? If only all the waters of the earth would turn to wine! And the leaves of the trees turn to gold! Someone says, "I wish my flowers would always bloom and never fade." People who like the moon wish it would always be full and never wax or wane, "The full moon is so bright and pretty. And I do not need to light lamps, so I save money." Wouldn't you say that was stupid? Can the moon be full every night? No, that is impossible. People who like to drink think, "Every day I have to go buy my bottle of whiskey or brandy, and it is very expensive. Wouldn't it be great if the lake turned into liquor? I could just go down to the lake and take a drink whenever I felt like it." People who are greedy for money think, "I have to go to work to earn money. It is really painful. If all the leaves of the trees turned to money, wouldn't that be great?" But that is obviously impossible. It is just another form of wishful thinking. Another stupid person might wish for a Ph.D. degree when he has not even gone to elementary school or high school. That, too, is stupid. Someone may want to win the horse races when he has not even bought a ticket. Stupid as it is, most people fall prey to such types of thinking. So what is to be done? If you are prone to this type of thinking, you should change, that's all. With great kindness, Guanshiyin Bodhisattva helps living beings leave suffering and attain bliss. The “Universal Door of Guanshiyin Bodhisattva Chapter” is spoken out of great kindness and great compassion. 3. Blessings and Wisdom. It is said that Guanshiyin Bodhisattva "follows the sounds to relieve beings from suffering." He distinguishes all the different sounds in the world--good sounds, bad sounds, sounds of suffering, sounds of joy, sounds of what is right, and sounds of what is wrong. He does this with his wisdom. Where does his wisdom come from? It comes from the practice of giving. He gives the Dharma to living beings, and as a result, he gains boundless wisdom and blessings. 4. True Body and Response Bodies. Guanshiyin Bodhisattva uses the wonderful power of the true body to rescue living beings from the seven kinds of difficulties, to counteract the three poisons, and to fulfill the two kinds of seeking. He also manifests in thirty-two kinds of response bodies. The “Universal Door Chapter” is spoken on the basis of the true body and the response bodies. 5. Medicine King Tree. What is the Medicine King Tree? Long, long ago, there was a man who went into the mountains to gather firewood. Then he would take it to the market to sell. One day, he met a doctor. The doctor saw something emitting light in the firewood, so he bought the wood and took it home. When the doctor opened the bundle, he found a Medicine King Tree. No matter what illness people had, all the doctor had to do was to swish the Medicine King Tree over the patients or gently tap them with it, and they would be cured. In this way, he saved many people. What is the Wish-Fulfilling Pearl? "Wish-Fulfilling" means that you obtain what you wish, according to your heart's desire. If you want something nice to eat, something very delicious will manifest from inside the pearl for you. If you want some nice clothes, the outfit of your dreams will manifest from the Wish-Fulfilling Pearl. This pearl can manifest clothing, food, and even a place to live. You can say, "Tonight, I want to stay in the most beautiful house," and it will manifest for you. The next day, the house will go right back into the pearl. The pearl can manifest exactly the right amount of food for you, never too much or too little. That is why it is called Wish-Fulfilling. As to your clothes, you would not need to hang them up in the closet, because when you are done wearing them, they will go right back into the pearl. How big is the pearl? It is pretty small. You can carry it with you. It is not heavy, and it does not take a lot of room. A man is thinking, "Can it get me a pretty wife?" Well, I do not know about that. A woman is thinking, "Can it get me a handsome husband?" Do not ask me; I really do not know. In any case, then, the “Universal Door Chapter” is like a Medicine King Tree and a Wish-Fulfilling Pearl. It fulfills your wishes just as you desire. All you have to do is recite the “Universal Door Chapter,” and you will get what you wish for. You cannot recite it today, however, and have a response tomorrow. You have to lay a good foundation first. It is like constructing a building. You have to lay the foundation first. Without the foundation, you cannot erect the building. The “Universal Door Chapter” is like a Medicine King Tree and a Wish-Fulfilling Pearl. It is that magical, amazing, and inconceivable; but you first have to recite it. You should recite it every day until Guanyin Bodhisattva thinks that you have passed the test, that you are sincere enough. If you do not recite it regularly, you cannot obtain a response when you need one. You have to apply effort in your cultivation in an ordinary manner--then an inconceivable response has a chance to occur. Someone says, "There are too many things to learn in Buddhism. There is the Shurangama Mantra, the Great Compassion Mantra, and now the ‘Universal Door Chapter.’ Where am I going to find the time for all these?" It does not take that much time. All you have to do is to skip an hour of sleep and do a little less chatting with people. If you have no aspirations, or no wishes that you would like to be fulfilled, then you do not need to recite. If you say, "I do not want anything. I am not greedy for anything. I am not hateful or stupid, so I do not need to recite this," then what is there to talk about? But if you feel that perhaps you might run into trouble and need Guanyin Bodhisattva's help in the future, then you should certainly study a bit more Buddhadharma. The Buddhadharma is like a great sea, and none of you have drunk even one drop of it yet. You will never be able to drink it all. But even though you cannot drink it all, you can drink your fill according to your capacity. The Buddhadharma is endless for the taking and inexhaustible in its function. Thus, we study and recite the “Universal Door Chapter” because it is like the Medicine King Tree and the Wish-Fulfilling Pearl. 6. Manifest and Secret. When you recite the “Universal Door Chapter,” sometimes you will obtain a revealed or manifest response. At other times, you will obtain a secret or hidden response. A manifest response is one that everyone can see and understand. The “Universal Door Chapter” says, "If he enters a great fire, the fire will not burn him." While this great fire blazes, if you single-mindedly believe in Guanshiyin Bodhisattva, and recite his name with true faith, the houses around may burn down, but your house would not. But this applies only if it is an accident. You cannot decide to try it out and light a fire to see if your house will burn. If you do that, your house is sure to burn down. Why? Because you are testing Guanshiyin Bodhisattva. This shows that you do not have adequate faith. That is like testing your friend to see if he is really a loyal friend. "I will just leave five hundred dollars here on the ground. If he is a good person, he would not take it. If he is a bad person, he will." But why do you want to test out your friend? Because you do not really recognize him. You do not truly know if he is a good friend. If you do not believe the Sutra and you feel you have to test it out to see if the fire will burn you, you basically do not believe in Guanshiyin Bodhisattva. Since you do not believe in Guanshiyin Bodhisattva, he does not have the time to watch over your affairs. Go ahead and burn your house down if you like. If you want to commit suicide and jump into the ocean to see if the water will drown you so that you can test out Guanshiyin Bodhisattva's spiritual powers, Guanshiyin Bodhisattva is not going to pay any attention to you. Since you do not believe in him, he is not going to involve himself in your business. But if your house accidentally catches fire and you recite with true sincerity, you would not be burned. But it has to be accidental; it cannot be something that you try as an experiment. "Well, ultimately I would not know if it is true or false if I do not test it out," you say. If you know it is true, then what? If you do not know it is true, then what? Whether you know or do not know that it is true, you still have to eat and wear clothes in order to live. So isn’t it a superfluous question? So the neighbor's house burns down, but yours does not. That is called a manifest response. Everybody knows about it. There may also be a secret response. For example, perhaps you are due for some calamity--you were due to fall into the sea and drown--but Guanyin Bodhisattva secretly arranges it so that the calamity does not happen. Nobody knows about it. Even you do not know about it. You were supposed to undergo a calamity but it disappears. That is called a secret response. Say someone was supposed to be burned to death in a fire, but he believes in Guanyin Bodhisattva and his disaster vanishes. You could have been due to die in a plane crash, a train crash, or on the highway, but because you believe in Guanyin Bodhisattva and you sincerely recite the “Universal Door Chapter” and the Great Compassion Mantra, Guanyin Bodhisattva secretly and silently dispels calamities and turns your misfortune into good fortune. Everything is auspicious and as you wish. Thus, the “Universal Door Chapter” was spoken because of the manifest and secret responses. Both the manifest and secret responses are perfectly interpenetrating, and so the merit and virtue of the “Universal Door Chapter” is inconceivable. Once in Manchuria, there was a farmer who was returning home with his friends from a business trip. When he was almost halfway home, he saw a band of robbers about a mile up ahead. What was he going to do? He could not run away because the robbers had caught sight of him, and so he was sure to be robbed. Just at that moment, he recited the Great Compassion Mantra. When he got to where the robbers were, one of them came forward and took the reins from the driver, saying, "I will drive." They drove right through the gang of bandits as if they were invisible. When they were safely through, the man gave the reins back to the driver. The farmer said, "You saved us from the robbers today. What is your name? Where do you live? I would like to send you a reward." The man said, "My name is E Shi Yun." Now, everyone knows the line E shi yun is from the Great Compassion Mantra, and that it is also the name of a Dharma Protector. At that time, the farmer did not remember that E shi yun was a line from the Great Compassion Mantra. After the man left, he remembered, "He is a Dharma Protector in the Great Compassion Mantra!" This is an inconceivable state manifest from the Great Compassion Mantra. But if you recite it just to test it out, E Shi Yun is not going to show up. It is only if you recite and believe in the Mantra that unlucky circumstances can be turned into lucky ones. If you run into E Shi Yun, be sure to recognize him. Do not be like the farmer who did not remember who he was until he was gone. 7. Provisional and Real. Guanshiyin Bodhisattva uses the power of the Dharma body to secretly benefit living beings. This is called the real. He also uses the thirty-two response bodies to teach and transform living beings. This is the provisional. Guanshiyin Bodhisattva provides living beings a temporary teaching to lead them to the real teaching. Because of the provisional and the real, the “Universal Door Chapter” was spoken. The moon lends its reflections to the waters of a thousand rivers. The “Universal Door Chapter” is spoken because of the root and traces. With one Dharma body, Guanshiyin Bodhisattva manifests within the hearts of all living beings. He causes all living beings to change from evil and go toward the good, to leave suffering and attain bliss, and ultimately to become Buddhas. Someone is thinking, "No wonder I have not changed for the better. Guanshiyin Bodhisattva has not manifested in my heart. That is why I do not wish to change my faults." Those who smoke, think, "Probably the reason I have not quit smoking is that Guanshiyin Bodhisattva is not helping me." Someone who likes to drink is thinking, "It is Guanshiyin Bodhisattva's fault that I have not quit drinking. He is not helping me." And suddenly he is upset with Guanshiyin Bodhisattva, "He is unfair! Why does he help other people but not me?" Now, that is stupidity added onto stupidity. Why isn't Guanshiyin Bodhisattva helping you? Because you do not listen to his instructions. 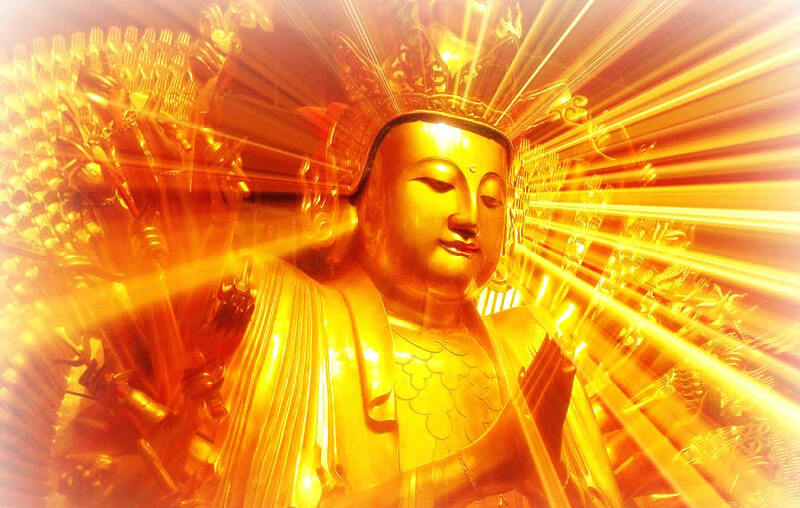 Hearing Guanshiyin Bodhisattva's name, you should reform yourself and go toward the good. You should calm your mind down and cool off. Let go of the past and concentrate on doing better in the future. For instance, if you take the precepts, you must keep them. If you know something is wrong but you still go ahead and do it anyway, then your offenses are doubled. It is a mistake to blame Guanshiyin Bodhisattva for not protecting you. Guanshiyin Bodhisattva wants to help you out, but you keep the door of your mind closed. You don't let him help! All that Guanshiyin Bodhisattva can do is sigh and say, "You are truly pitiful!" So do not blame Guanshiyin Bodhisattva. 9. Condition and Finality. "Condition" refers to causes and conditions. "Finality" means putting an end to the cause; it also means understanding the cause. During this Summer Session, people get up very early in the morning and use every minute to study the Dharma. Those who live far away rise at four o’clock in the morning so they can come to meditate and study the Sutra. There are even students working on their Ph.D.’s, Master’s, and Bachelor’s degrees from the University of Washington in Seattle who have come to join the session. This shows that they recognize the importance of the Buddhadharma. Why have people come such great distances to hear the Dharma? Because they want to understand and put an end to the cause. Hearing the Sutra plants a seed for putting an end to the cause. During the first ninety-six-day summer session [in 1968] people were so absorbed in their work that they did not taste their food or drink and did not know whether they were awake or asleep. What were they doing? They were singlemindedly studying the Shurangama Sutra. Every day from six in the morning till nine at night, they listened to four hours of lectures, meditated, did their personal practices, and took meals. The time passed swiftly, and although people had some afflictions, I believe they did not take them too seriously. The ninety-six days were soon up. Realizing the importance of studying the Buddhadharma, over ten of these people moved from Seattle to San Francisco. They gave away most of their possessions and everything. Among them, the translator was the first one to move down. He was studying at the University of Washington and could have graduated much earlier. But since he has transferred to University of California at Berkeley, it will take him longer to graduate. This shows how these students all look upon the Buddhadharma as important, and so they have come from many miles away to study it. In the future when you have understood the Buddhadharma you will be able to teach it to your fellow Americans. Then I would not have to expend so much energy. I explain the Sutra once and you do not understand, so I explain it again and you still do not understand. Why? Because I cannot speak English. Those who know Chinese can understand me, but those who do not cannot. For example, Guo You is very sincere, but when I lecture he just stares at me without any idea of what I am saying. So it is very difficult. Now that you are learning the Buddhadharma, you can explain it very naturally and eloquently without even thinking about it. This will make it much easier. Thus the “Universal Door Chapter” is spoken because of the condition and Finality. 10. Wisdom and Severing. Another reason is the pair of wisdom and severing. Guanshiyin Bodhisattva is adorned with both the virtue of wisdom and the virtue of severing. With the virtue of wisdom, he teaches and transforms living beings. With the virtue of severing, he cuts through and severs all forms of ignorance. The virtue of severing can also be called the virtue of blessings. Because the Bodhisattva has severed ignorance, he is truly adorned with blessings. The Buddha is complete with blessings and wisdom. Although a Bodhisattva, Guanshiyin is also adorned with blessings and wisdom. Taken altogether these are the ten causal conditions for the speaking of the “Universal Door Chapter” of the Wonderful Dharma Lotus Flower Sutra. Before we delve into the Sutra text, let us look into the meaning of the name Guanshiyin Bodhisattva, the Bodhisattva Who Contemplates the World's Sounds. Guan, “contemplate,” is the wisdom which contemplates. Shiyin, “the world's sounds,” are the states he contemplates. No matter what the sound is, this Bodhisattva knows it. He knows all the sounds of living beings, every single sound. Why? Because he contemplates them all day long! Sounds are basically heard, not seen. Why is it said he "contemplates" or "observes" them? Can you see sounds? No. But Guanshiyin Bodhisattva can see them! You cannot see them, but he can. He sees them as if they were on a radar screen. Every living being manifests as a blip on his radar screen. He can chart you every sound. That is one way to explain it. There is another way, and that is that Guanshiyin Bodhisattva can see with his ears, and hear with his eyes. Even though we say he observes the sounds of the world, he can also hear with his eyes. Not only can he see with his eyes, he can hear with them as well. Why? Because he has the spiritual powers of the interpenetration of the six sense organs. Those who cultivate the Dharma Flower Sutra will obtain the purity of the six faculties. They can then use the six sense organs in mutual interpenetration. How much the more so can Guanshiyin Bodhisattva! Guanshiyin Bodhisattva, then, can speak with his ears, eat with his ears, listen with his eyes, and think with his eyes. Guanshiyin Bodhisattva gained the state of the mutual interpenetration of the six sense organs a long, long time ago and so he is able to contemplate the sounds of the world. "Why does he want to look after so many things?" you ask, "observing sounds all day long. What use is that?" Guanshiyin Bodhisattva does this because he cannot put down living beings--you, me, and others. He sees all living beings as his own children. Guanshiyin Bodhisattva is like a mother to all of us. He is always checking to see which child is crying, which child is laughing, and which child might be cold or hungry. He is busy all day long looking after all of us kids. "Does that make him some kind of a baby-sitter?" you ask. Pretty much, yes. But he does not get paid. Too bad! Because he cannot put living beings down, he wants to contemplate the sounds of the world. He looks to see what suffering living beings are undergoing, and he finds a way to help them. When he sees living beings involved in a disaster, he saves them from it. Guanshiyin Bodhisattva "follows the sounds to rescue beings from suffering". If you are suffering, all you have to do is recite "Namo Guanshiyin Bodhisattva", and you will find your unlucky circumstances turn into good fortune. Everything will turn out just as you want it to. Most people do not know about this most wonderful Dharma and so when they are in greatest danger, it does not occur to them to recite Guanshiyin Bodhisattva's name. If, in great danger, you can remember to recite Guanshiyin Bodhisattva's name, you will be okay. If you are in a fire, it would not burn you. If you are in the water, you will not drown. If you do not know how to swim, you will just find yourself in a shallow place. Such are the responses from Guanshiyin Bodhisattva. All you have to do when in great danger is recite Guanshiyin Bodhisattva's name. You are sure to gain a response and be rescued. But you must have faith. You cannot waver between faith and doubt. Let us say you are in a fire and you are reciting Guanshiyin Bodhisattva's name but you are thinking, "This is not going to work. Nothing is that magical." With that one doubt, he would not be able to rescue you. Why not? Because you do not believe. You must believe single-mindedly. "I am reciting and Guanshiyin Bodhisattva will certainly come and save me." Let us say a tiger is just about to swallow you up. You shut your eyes and recite, "Namo Guanshiyin Bodhisattva". Suddenly, the tiger would not be able to open his mouth! That is how powerful Guanshiyin Bodhisattva is. Bodhisattvas are beings who enlighten other living beings. They are also called "living beings with great minds for the Way". They are "those who enlighten sentient beings". They can also be called "sentient beings who are enlightened".